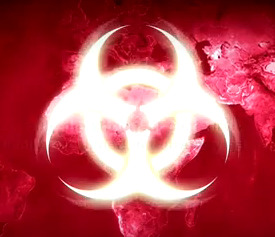 In case you missed it, the official Plague Inc. cinematic trailer was released a few weeks ago. (link). This was partly to celebrate the launch of Plague Inc. on Android devices (link) but more importantly – to say thank you to all the millions of players and fans who have supported Plague Inc so far on its incredible journey. I have had quite a few people ask me how I came up with the idea of the trailer, how it was made etc so I have decided to write a (monster) article to cover the concept and the collaborative effort that it took from lots of people to make it a reality. Making a cool trailer for Plague Inc. has been on my to do list for half a year but it was a big task and I had many other things to work on first. Once I decided to use Miniclip to bring Plague Inc. to Android, I mentioned my trailer to Sergio Varanda, the Head of Mobile at Miniclip and he agreed that his team would help produce the trailer. Exceptionally high quality / “Cool” – Plague Inc. is an extremely high quality game and the trailer needed to match this. I wanted people to be wowed by it and want to play the game after seeing it. A lot of trailers for mobile games are pretty simple gameplay trailers. These are functional and show the player what to expect but they don’t capture the players imagination and make them rush off to tell their friends about it. This one would be different! A narrative driven experience – Plague Inc. is a very personal game and a lot of it takes place inside the mind of the player. I wanted to expand the narrative, spurring the imagination of players by giving them a different view of the world that they create inside the game. 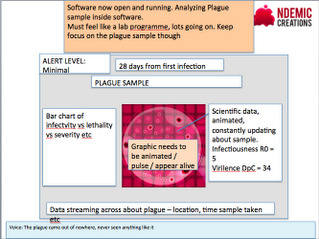 Self contained – It had to be a cool trailer for people who had not played Plague Inc.
With all of this in mind, I wrote the concept and script down into a 5 page design document. Now stuff could really start to happen! With the concept and script written, I pulled together a storyboard which I passed along to the talented graphics team at Miniclip - Ricardo Serrazina and Vasco Pires. They took my ugly, blocky storyboard and began to brainstorm the elements and visuals that they would use. Once they had the detailed design sorted, Vasco got to work. He used stock footage for the news clips and some existing assets from Plague Inc (my graphics designer Sofia Merkulova) but everything else was created from scratch using Photoshop. "When James approached me to do a little bit of voice work for the trailer, I feared that Ndemic Creations would release a brutal virus in my neighborhood so I graciously accepted! Seriously though I'm totally addicted to Plague Inc and I was happy to help out"
The music and effects are a great way to connect the trailer to the game so we used the original “Plague Bloom” piece by Joshua Kaplin for the music. On top of the game sound effects, Vasco managed to find some other effects to help support the graphics and interface that the viewer sees. The final step saw Vasco combining and synchronizing the voice, sound, and music with the graphics. And here is the end result – I am very proud of it and want to say a big thanks to everyone who helped produce it. Hope you found this interesting - follow me on twitter / facebook for more debriefs and updates.